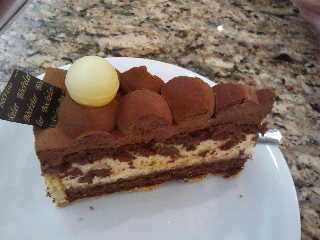 German cakes and pastries.... they are the reason why I have gained about a stone since moving to Germany. Oh, and the fact I cannot stop myself from eating them! But I am determined that this year I shall make more of an effort to exercise and stop eating so many cakes. Easier said than done of course. I need more willpower! As long as I can remember I have had a sweet tooth. In restaurants I tend to read the dessert menu even before picking my main course. And I am lucky that I was naturally slim and able to eat what whatever I wanted and have never needed to diet. Since moving to Germany however, I am noticing that I cannot just eat absolutely anything without weight gradually creeping on. It's actually also well known that moving in with your partner causes you to pile on the pounds. Women tend to match their dinner portions to their partner's, forgetting that men can get away with more calories and then there are the countless nights in on the sofa together or big fancy meals out. Add that to living in Germany with a bakery supplying delicious cakes and pastries on every corner and it's a recipe for... lots of fun times eating cake! Google finally let me follow your blog, yay! It is also not fair that boys can eat as much as they do. For this reason, I get very depressed that I have the bottomless pit of a husband that I do. Not as much of a fan of the German bread myself but we all have some weakness I think! I must get back into the cycling again soon myself once the weather gets a bit warmer. And yeah, I am also amazed at the massive amount that the GerMann can eat! Yeah, let's talk about dessert! I love the cakes (and muffins, and scones, and croissants, and...)here, too, and could easily eat them daily, but I am also going to make a real effort this year to keep them an occasional treat, as they should be. The cakes in your photos look so delicious! Now for me, I could live without bread, just a Broetchen or two for breakfast on the weekend would be enough. It's all about the cakes! You're so right. I also find desserts taste that much better when they are occasional treats and not just eaten every day! Those cakes look absolutely delicious. I feel your pain in having to not give in to temptation living in Germany. Even the coffee with whipped cream on is to die for!